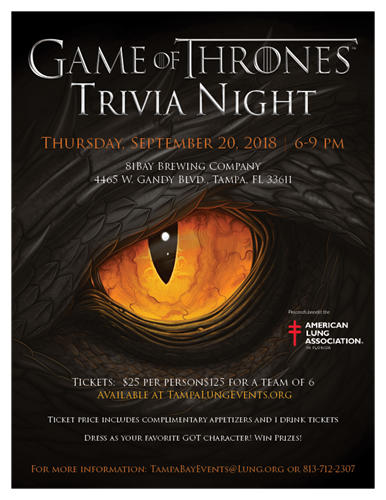 Join us at 81Bay Brewing Company in South Tampa for Game of Thrones Trivia Night to Benefit the American Lung Association in Florida: Tampa Bay! Sport your best Targaryen or White Walker wear, brush up on your knowledge of the land of Westeros, and have the chance to win amazing prizes. Ticket price of $25 (or $125 for a table of 6) to play includes delicious complimentary appetizers and a drink ticket*. FREE to come and hang at the brewery and watch! We will also have some great raffle items! Special host DJ NiLLa! Trivia questions will be based on the television series, not the book.